Achieve salon-style results from home with the butter LONDON 'Primrose Hill Picnic' Trend Nail Lacquer; a high-pigmented, vitamin-rich nail polish in a fuchsia pink crème. Aplicar una capa de esmalte y dejar secar. Aplicar una segunda capa. Butyl Acetate, Ethyl Acetate, Nitrocellulose, Acetyl Tributyl Citrate, Adipic Acid/Neopentyl Glycol/Trimellitic Anhydride Copolymer, Isopropyl Alcohol, Styrene/Acrylates Copolymer, Stearalkonium Bentonite, Silica, N-Butyl Alcohol, Benzophenone-1, Diacetone Alcohol, Trimethylpentanediyl Dibenzoate, Polyethylene, Phosphoric Acid, Ascorbyl Palmitate, Tocopheryl Acetate, Calcium Pantothenate, Glycerin, Equisetum Hiemale Extract, Hydrolyzed Silk, CI 77891 (Titanium Dioxide), CI 15850 (Red 6 Lake), CI 15850 (Red 7 Lake). 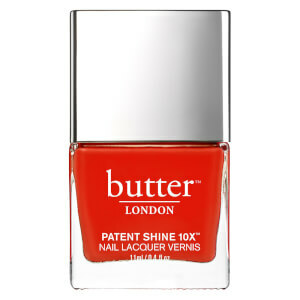 Esmalte de Uñas Patent Shine 10X de butter LONDON 11 ml - Smashing!